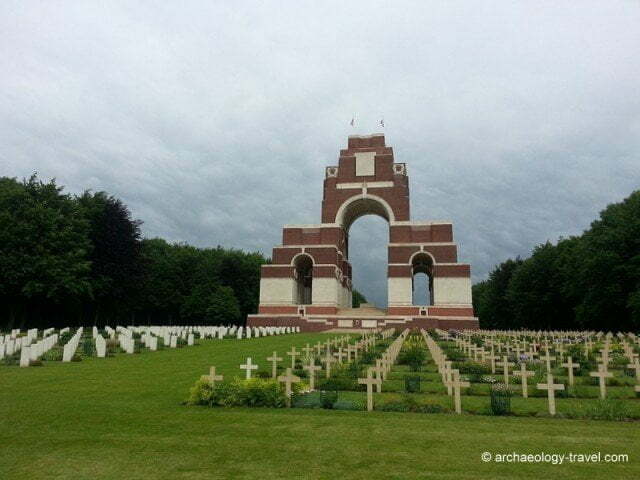 The Thiepval Memorial to the Missing of the Somme. When thinking of World War One, also known as the Great War, more often than not it is the memorials on the Somme Battlefields and further north into Belgium that immediately come to mind. 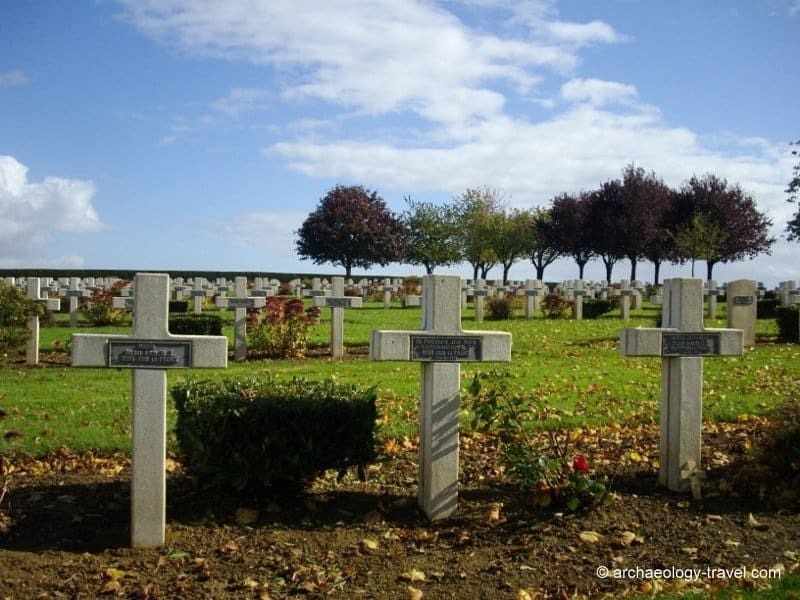 Here immaculate cemeteries and moving monuments stand as a reminder of the many young men who lost their lives, on both sides of the Western Front. 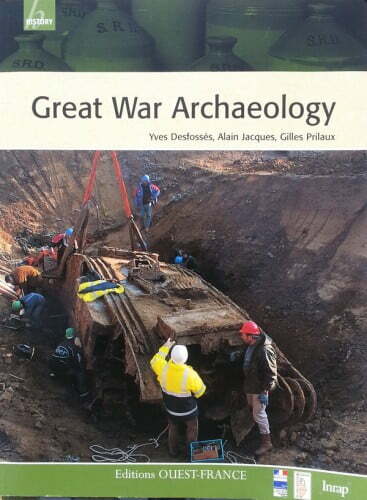 The recently published Great War Archaeology explores features of the first World War we do not usually consider. Whenever visiting the very visible memorials and cemeteries of the Somme Battlefields so many people find it difficult to look out on today’s rich agricultural land and appreciate that these are the very same devastated fields of Word War I which we have all seen in photographs. It really is quite difficult to superimpose the horrific black and white images onto these seemingly peaceful fields, which depending on the time of the year look so productive now. Out of sight, often just beneath the surface of these fertile fields is another side to the first World War. 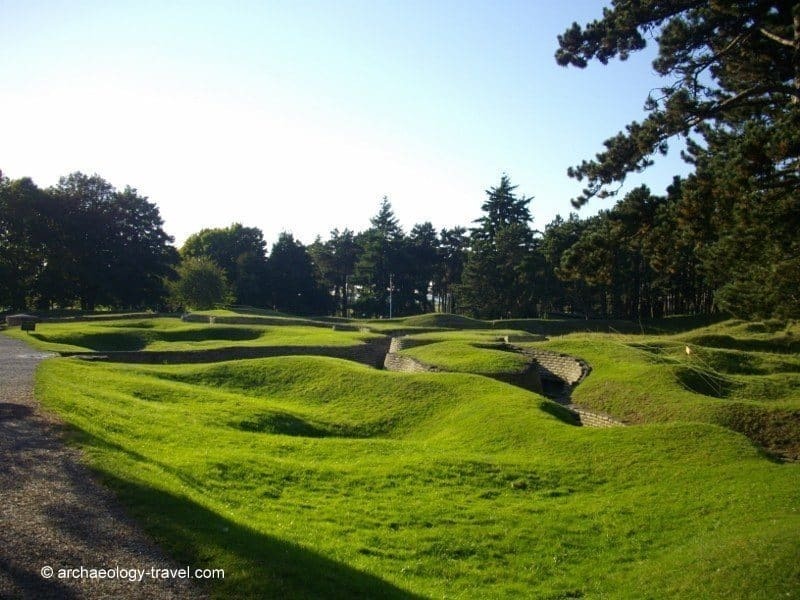 Vimy Ridge: One of only a few WWI sites where trenches have been restored. Soon after the war ended residents returned to their devastated villages and farms. Recovered bodies were re-buried in cemeteries. Villages and houses were rebuilt, and crops soon erased the scars of conflict. 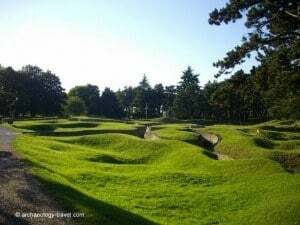 Only at a few sites, such as Beaumont Hamel and Vimy Ridge, were the trenches restored and stabilised and retained as memorials. After about two decades the physical signs of the war had all but disappeared. But over the last fifty or so years archaeologists working on construction sites in the area, such as the industrial zone outside Arras or various new, high-speed train lines, have been excavating the archaeology of the Great War. Illustrated with numerous historical and archaeological photographs this book is a fascinating account of this rescue archaeology. Some of the archaeology described in this book was no surprise. There are still thousands of men whose bodies have never been found. On average, each year 20 bodies are found and recovered by archaeologists. Many of these are of men who were buried where they fell and were subsequently ‘buried’ by soil from exploding munitions. In some cases, these bodies have been identified and the remains have been re-interred with their comrades in the relevant cemetery. The book recounts some very moving instances of the recovery of known individuals. But there is more to Great War Archaeology than this. If, like me, you thought we already have a very thorough account of the First World War, after all it is not that long ago and we have numerous diaries, reports, photographs, then this book is a must. The authors, leading archaeologists in northern and north eastern France, show how the results and analyses of their excavations add considerably to our understanding of the conflict, and in some cases even provides physical evidence that contradicts official documents. Even with the various letters and diaries we have, it is the commonplace aspects of the war that we have little or no information for. And this is where archaeological excavations in northern France have provided detailed evidence for what the lives of soldiers on both sides was really like. For example, studying the excavated remains from rubbish pits has provided a great deal of information about cultural habits and practices of the different nations – rarely detailed in personal diaries or official records. Analysis of the archaeology of these pits also provides for fuller explanations about the logistics of keeping the frontlines supplied with provisions. This is an archaeology like so few others. Very, very rarely are archaeologists excavating the bodies and remains of men whose memory is still present. And this comes through on every page. I bought my copy on a recent visit to the Thiepval Memorial. And I was not sure what to expect, in fact I am still not sure why I bought it at all – I have seen it in bookshops before. Once I began reading the book, however, I genuinely could not put it down. Not only is this a very readable book, and thankfully the English translation is excellent, it is also a very sensitive and thought-provoking account of a developing area of study within archaeology, written by three archaeologists who have clearly been at the forefront of these developments. The French cemetery in Rancourt. For anyone with an interest in our developing understandings of the Great War, and certainly for anyone planning on visiting the area for next years 100 year anniversary, I can not recommend this book enough. For those who have already read the main texts dealing with WWI (I have read one or two), this book will be a breath of fresh air, it demonstrates well how archaeology makes an unique contribution to our understanding of events in the past. Fantastic! Love that archaeological excavations can provide more details on what soldiers’ lives (on both sides) were like.